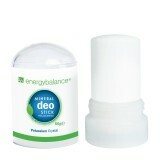 Crystal deodorants by EnergyBalance™ contain potassium crystal, also referred to as alum. Alum is a natural crystal made up of the hydrated double sulfate salt compound of potassium and potassium aluminum sulfate. That means that alum contains a natural aluminum sulfate compound, which, however, is not harmful like aluminum chloride. Aluminum chloride helps prevent sweating, it penetrates the pores and contracts, deforming or denaturalizing the pores of the skin. 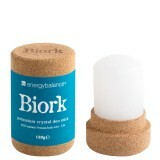 In contrast, crystal alum stays on the surface of the skin and is anti-bacterial without penetrating the skin. 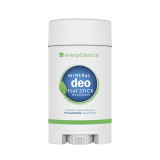 Due to controversial discussions concerning deodorants containing alum, EnergyBalance decided to make organic deodorants that do not contain crystal alum. These are made of 99.7% organic and natural ingredients, and all contain 75% organic aloe vera. 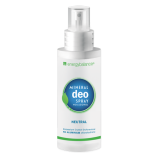 Why should your deodorant be free of aluminum chlorides? 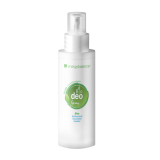 Deodorants, also called antiperspirants, contain sweat-blocking substances that are intended to prevent sweating and thereby prevent body odor caused by sweat. . Ordinary deodorants contain aluminum chloride. When put on the skin, aluminum salts cause the pores to contract and reduce perspiration through a process of denaturation of skin proteins. Aluminum chlorides not only inhibits perspiration, they can also lead to inflammations, so-called toxic skin irritations, inflammation of the sweat glands, and granulomas - inflammation-related knot-like lumps of new tissue. In the USA, aluminum is classified as a neurotoxin. A neurotoxin, or nerve poison, is a poison that especially affects nerve cells or nerve tissue. It interferes with membrane proteins in particular, as well as the interactions in ion channels. Studies have shown that aluminum alters the function of the blood-brain barrier that regulates the exchanges between the central nervous system and the peripheral circulation. Aluminum chloride and aluminum salts are most commonly used in antiperspirants. Increased aluminum levels have been determined in people suffering from Alzheimer's disease. Scientists assume that the accumulation of aluminum in the brains of Alzheimer's patients results, among other things, in the destruction of nerve cells. In addition, there are several indications that aluminum bonds increase the formation of so-called free radicals. These occur in the body constantly; they destroy proteins and play a role in various illnesses. They may play an important role in the destruction of nerve cells in Alzheimer's disease. It is also known that aluminum alters the activity of several of the nervous system's key enzymes. Europe's largest selection of natural deodorants is being created in this category. Your body is subject to the laws of nature, respect and support its natural functions. 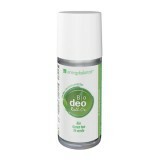 Groom yourself gently and naturally with a natural deodorant, your body will thank you.